Conceived in secrecy and dedicated to the proposition that Republican state legislative leaders should rule Wisconsin, the recently passed "extraordinary session" package of legislation should be vetoed by Governor Scott Walker for the benefit of the citizens of this state. While Walker has spoken favorably about many of the highly-partisan measures that were unveiled, unleashed and rammed through the Wisconsin Legislature in less than 100 hours – before most of the public could even find out what they were all about – he needs to hear from as many Wisconsin citizens as possible to tell him that the fate of this disastrous package of ill-conceived legislation rests solely in his hands and he should veto all of it. 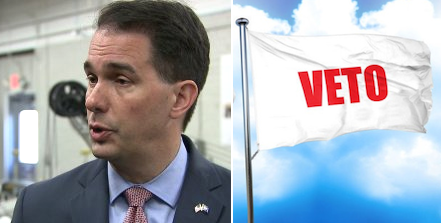 Walker's decision to either do the right and fair thing and veto the entire package of bills, or, to side with the narrow, partisan special interests such as Robin Vos, Scott Fitzgerald and Wisconsin Manufacturers & Commerce – and virtually no one else – and sign these misguided measures into law as his last official act as Governor, will profoundly determine how history and the people of Wisconsin remember him and his legacy. That's up to Walker. But what is up to us, and what we must do, is make our voices heard and tell Governor Scott Walker that the citizens of Wisconsin categorically urge that he veto the entire Lame Duck Session legislation that is now on his desk. "This is no way to run a state government." 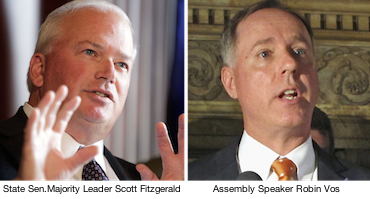 Exercising raw, hyper-partisan political power in secrecy, without regard to the views or even the basic expectations of the citizens of Wisconsin, is nothing new for State Senator Scott Fitzgerald (R-Juneau) and Assembly Speaker Robin Vos (R-Rochester). That has been their go-to modus operandi for the last eight years. But to attempt to ram through a whole host of measures specifically designed to enhance their own power right after the voters sent a resounding message that they want more balance of power and an end to one-party control of state government, demonstrates just plain contempt and a total lack of respect and regard for the citizenry of Wisconsin. Fitzgerald and Vos know they retain their partisan majorities in the Wisconsin Legislature by "virtue" of the fact that they supervised and engaged in one of the most partisan gerrymanders of any state legislature in the nation in the last 50 years. They just don't tell the truth when asked about that indisputable fact. With regard to the listing of "Extraordinary Session" agenda items Fitzgerald and Vos deigned to make public this past Friday afternoon, and plan to ram through the Joint Committee on Finance today and then, after a single public hearing, vote on and send to the floor of both the Assembly and State Senate as early as tomorrow for votes, Common Cause in Wisconsin is taking the unusual step of urging rejection of all of the measures under consideration. This is unusual for CC/WI because we normally do not weigh in on matters such as health care or transportation funding or the Wisconsin Economic Development Corporation. But we wholeheartedly agree with this excellent Sunday Wisconsin State Journal editorial, that "this is no way to run a state government." And so, because of the way all of these measures are being rushed through the legislative process with no time for the public to understand or digest their wide-ranging impact and ramifications for their lives, CC/WI urges that you contact your state legislators and demand they vote against all of them. 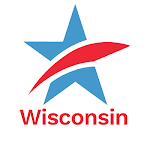 As we warned before Thanksgiving, we are particularly concerned about the hyper-partisan measure to move the date of the 2020 Presidential Primary in Wisconsin from the scheduled April date to March – just so it doesn't coincide with the Wisconsin Supreme Court election in which conservative Daniel Kelly will be up for election. Republicans have readily admitted that they fear a large turnout of voters in the Democratic presidential primary on that date will endanger Kelly's election prospects. So, at a cost of more than $7 million to you, the taxpayers – and against the strong opposition of Republican and Democratic election clerks from all over Wisconsin who have said this change will be impossible to administer and accomplish – they are going ahead anyway. We are also gravely concerned about a measure in this package that would further curtail early voting in Wisconsin by stipulating that it can only occur for up to two weeks before an election. The sole reason the Republicans want to make this change is because they were enraged by the many voters in Dane and Milwaukee Counties who engaged in early voting up to a month before the November 6th election. Dane and Milwaukee Counties voted more heavily Democratic than Republican. Republicans want less voter turnout and fewer Wisconsin citizens making their voices heard at the ballot box. With the State Assembly so overwhelmingly Republican because of gerrymandering, the Extraordinary Session package will be won or lost in the State Senate – also gerrymandered, but where the margin is closer. Two Republican State Senators are needed to sink the package in the State Senate and therefore end it all. Here are the Republican State Senators who have been identified as those who might be persuaded to do the right thing, instead of just following orders: Luther Olsen, Rob Cowles, Patrick Testin, Jerry Petrowski, Dan Feyen and Roger Roth. Please contact your own State Senator, State Representative, and – if you want to do more – those Republican State Senators listed above and urge them to vote against all of the bills that will be considered this week. Tell them you are tired of being disrespected and that you are mad as hell and aren't going to take it anymore. Here's how to reach your State Senator and State Representative. If you are not sure who your State Senator and your State Representative are, you can look them up here.